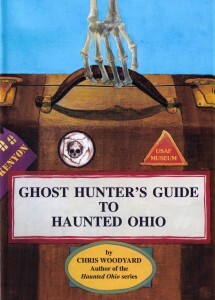 Don’t let the title fool you–because this is not just a list of haunted places in Ohio, but a chilling book of eyewitness ghost stories from many of Ohio’s haunted PUBLIC places including a terrifying visit to the Ohio State Reformatory (where The Shawshank Redemption was filmed) and a former lunatic asylum where ghostly lunatics still linger. So many of my readers wanted stories from places they could actually GO, that I compiled this book of stories from places like The Golden Lamb in Lebanon, Granville’s Buxton Inn, Kelton House in Columbus–where two former mistresses of the house haunt in tandem, a haunted vintage clothing store in Plymouth, a strange museum that time forgot in Mansfield, and The Old Stone House on the Lake in Marblehead where a little girl fell to her death.. From friendly to fearsome, these are chilling stories of places you can visit—if you dare. Stories from the following Ohio counties: Clermont, Crawford, Cuyahoga, Franklin, Geauga, Hamilton, Licking, Lucas, Medina, Montgomery, Ottawa, Perry, Richland, Ross, Warren, Washington, Wood.